“What’s the husband’s name again?”, I ask my wife on our way to a dinner party. “Give me a minute”, she says as she quickly goes to Facebook from her phone. “It is Bill.”, she says in a tone as if she knew it all along. I often tell that story and its worth repeating as an example of immediate accessibility to information. That is a good thing because truth be told, I can at times be pretty bad with names and related personal data. That is why when I meet someone and get their business card, I try to write their basic information and hopefully some personal information on the back of the card. If I have time, I enter a quick note directly into my CRM via my smartphone (yes there is an app for that). Over time, you probably add more and more information about your customers. Your best customers are the ones you know very well. You know their needs and how best to deliver against those needs. Your customers probably appreciate that fact as well and hence you have a good working business relationship. So what if you knew ALL your customers the way you know your very best customers?You probably would get a lot more business. You already know the detailed personal information of your best customers from the relationships you have built over a long period of time. Beyond their business needs, you might know their hobbies, interests, the college they went to and maybe even the college their kids went to. Do you have the same deep level of personal knowledge for all customers and prospective customers? Maybe. Maybe not. Keep in mind that just because you know a prospective customer graduated from the same school as you doesn’t mean that you will win their business, but knowledge like that can provide better insight and the opportunity to connect and build a stronger business relationship. Enter the age of social media. Validate and keep your own customer data accurate. Track additional demographic and personal information. Know when a key contact moved to a new company. Add additional contacts at a customer company to your CRM. Track and manage specific Twitter conversations about your company or your product directly in CRM. In Microsoft Dynamics CRM, this is done via the built-in integration to Twitter. Create a holistic view of your own data mixed with “public data”. For example, in Microsoft Outlook, you can access the customer’s Microsoft Dynamics CRM contact record and blend that information directly with LinkedIn and Facebook using the Outlook Social Connector. 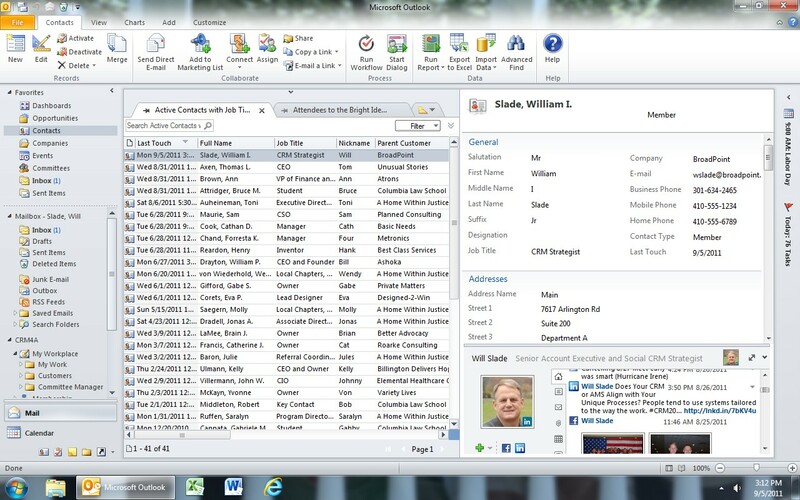 The below screenshot is Microsoft Outlook 2010 that is accessing a CRM contact record and displays in the lower right the live social updates and information. And below is a close up view of just the lower right portion of the above full screenshot. Notice that Outlook has pulled in the job title from LinkedIn. Even if you are not connected to a person on LinkedIn, their title, picture, and other public information will still display if you know their email address. Activity Feeds in Microsoft Dynamics CRM (see below example). 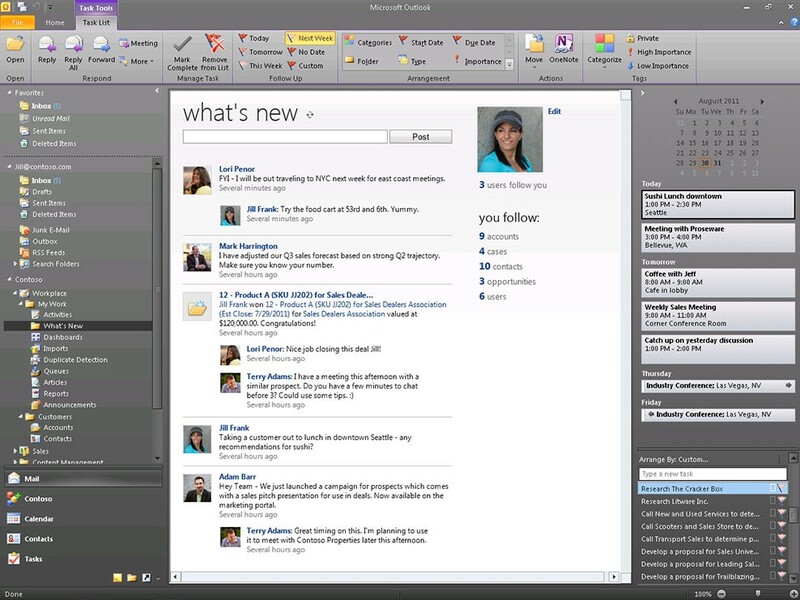 Microsoft Dynamics CRM with a “Facebook-style” interface. You can follow activity feeds, teams, accounts, opportunities, contacts, custom CRM records directly in CRM and hence directly from Microsoft Outlook. What about Facebook? – There certainly are other social tools to leverage for business beyond LinkedIn and Twitter. Facebook can sometimes be a bit more tricky from a business perspective. Facebook (and to some degree Google+) work very well for some business purposes and falls flat for others. Beyond Facebook, you can also look up other social networks such as a company’s YouTube channel to view their videos. You can even see if some of your customers have blogs and then actually go read them. Keep Up with Increasing Expectations – In summary, with all the information available on the internet, specifically with social networks, it is no surprise that customers expect more. Keep up with customer demands by leveraging information found with social networking directly in your own CRM. When it comes to customer buying decisions, I think people still buy from people – and these tools might just help with that. **Above screenshot with social activity feed (“What’s New”) is from Microsoft. See the press release: here. This entry was posted in CRM, Social CRM. Bookmark the permalink.